Hello friends! How was everyone’s weekend? We just got in after our red eye flight home from California. It is cold here! I was hoping it would magically turn warm while I was gone and we would jump right into Spring. A girl can dream. Anyway, I have lots to update you with so I figure I will have to do this in stages otherwise it will be too overwhelming for me. Here we go! Friday morning we flew (on first class!) into Los Angeles, California with one layover in Dallas. The flights were smooth, I read some of my book, Women’s Health Magazine, watched an episode of Whitney, and ate pretty good food! 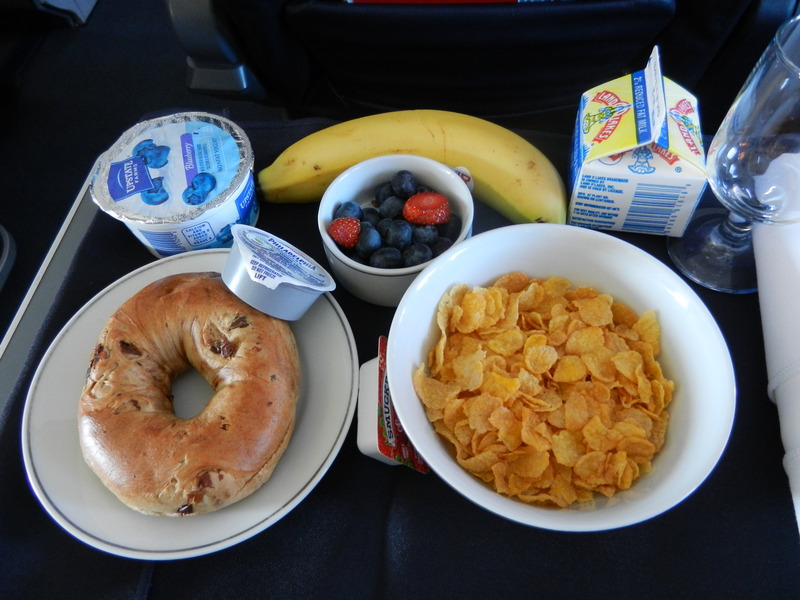 We ate breakfast and lunch on the plane. Carb city for breakfast. Out of this schmorgousboard of food I ate the bagel and the berries, and saved the banana for a mid-morning snack. I also made sure to keep chugging my water throughout the flights. It is so easy to get dehydrated on flights and I almost always feel pretty nasty after a flight. I always bring my big CamelBak water bottle and just fill it up once I get past security (since you can’t have more than 3 oz of liquids). It works well and helps me keep track of how much water I am drinking. Plus, it saves me from having to spend $2 or whatever it is for bottled water and more eco-friendly too. 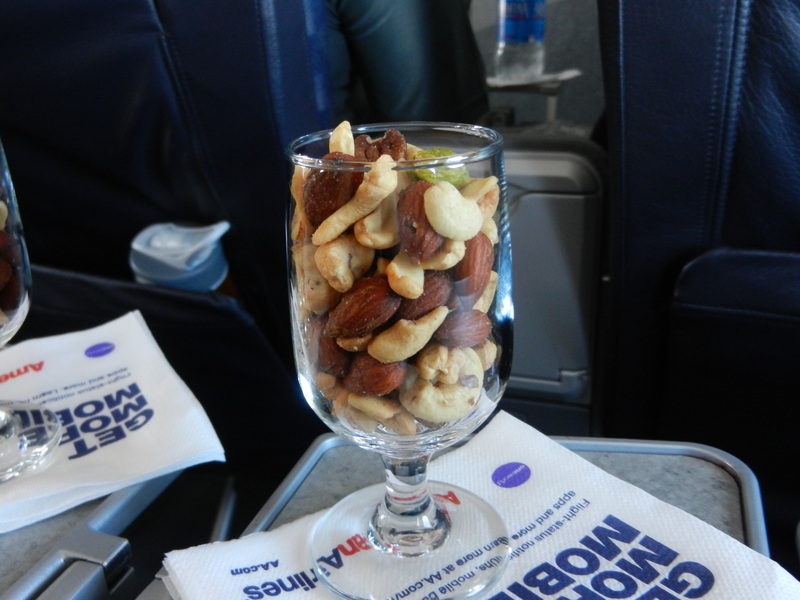 A few hours later it was time for lunch which began with warmed mixed nuts. Num! My favorites were the pistachios for sure. Next the main course which was a grilled chicken salad which had some type of sauce on it that tasted like salsa but I’m not 100% sure what it was. Anyway, mixed greens with grilled chicken, jicama, tomato, black beans, corn, and blue cheese crumbles. Yup, on the airplane. American Airlines did a good job! 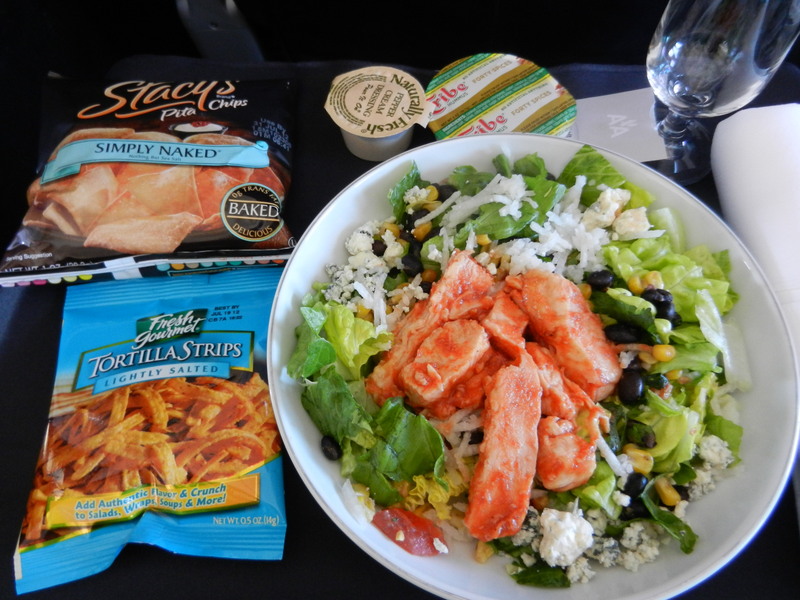 On the side was tortilla strips to go on the salad which I vetoed, and Stacy’s pita chips with Tribe hummus. It just kept getting better and better; so healthified! A tiny bit of a torturous moment was after lunch, there was a waft of a scent of warm cookies that floated by us. We both looked at eachother and said “ah man, cookies.” We did not give in even though they smelt wonderful. That was temptation #1 of the trip. 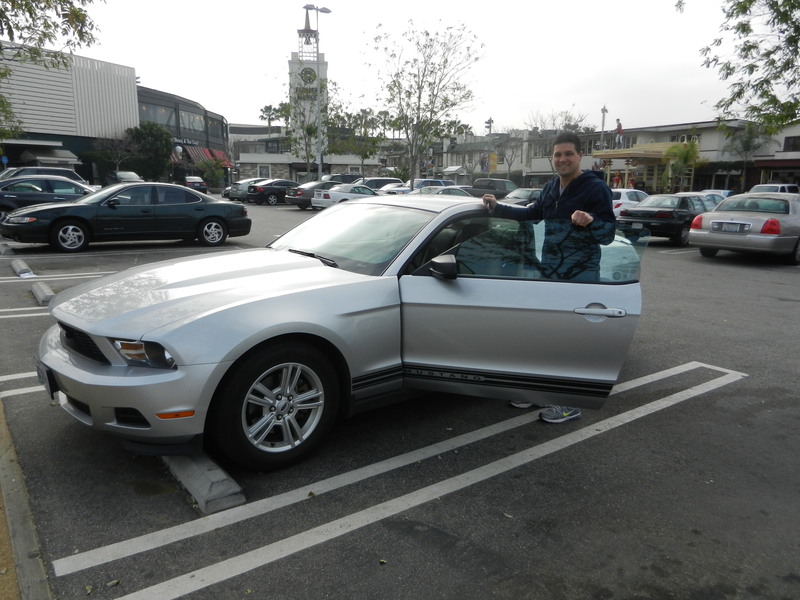 When we arrived to LAX airport we headed to pick up our rental car from Avis. We didn’t know what car we would be getting, we just knew it would be small because that is what we requested. We get to the front desk and the clerk says, “would you guys be okay with a Mustang?” Really? Haha. Was not expecting that but, why not! And there she is. The silver bullet (not to be confused with Coors Light). Once we found the 405 we headed out towards Hollywood area. It was beautiful outside when we arrived; about 65° at the airport, and as we headed towards Hollywood the temp crept all the way up to 86°! It was a crazy temperature change. 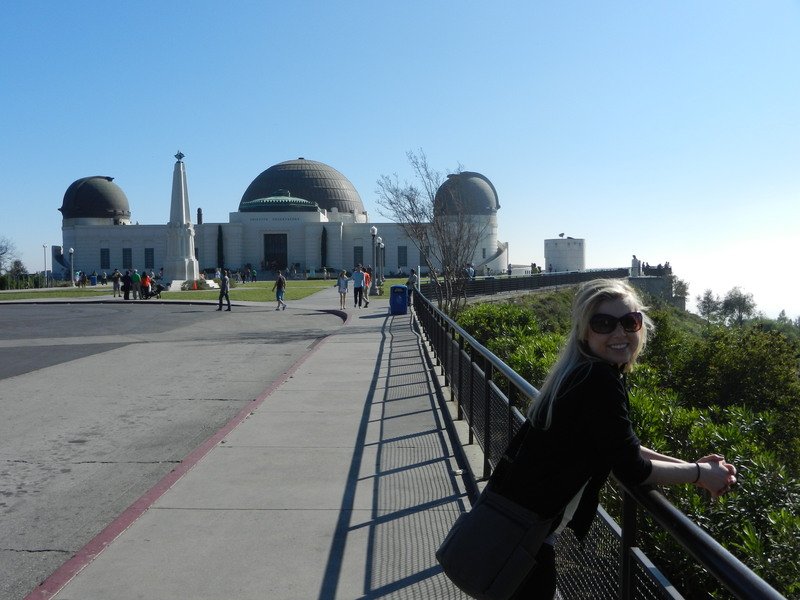 We headed to Griffith Park which overlooks the city and gives you a great view of the Hollywood sign. They also had a visitor’s center which was perty. I was loving the feeling of sun on my skin. I could have laid down right on that sidewalk and taken a nap. Besides the warmth of the sun, it was also so nice to see green everywhere! Back home in Minnesota it is pretty gray and dull right now. 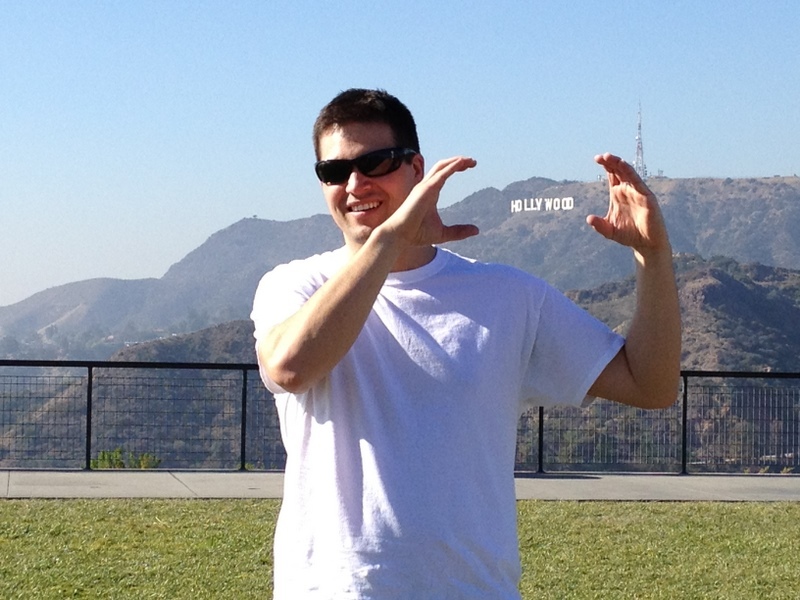 I soaked up the views and we headed out to meet up with our friend, Dalynn who lives in Hollywood. She lives just a couple of minutes away from the Kodak theater and we stayed at her apartment the first night. I am so upset I didn’t get a picture of Dalynn for this post! I couldn’t believe it! We met up and headed to a bar to relax for a bit with a couple of her friends. 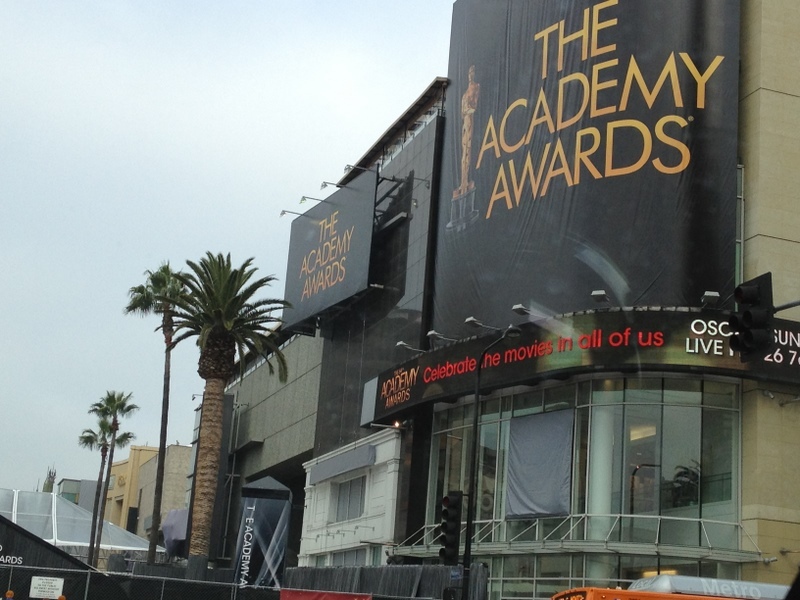 On our way to the bar we walked down the street to the area where the Oscar’s were going to be taking place two days from then (last night). 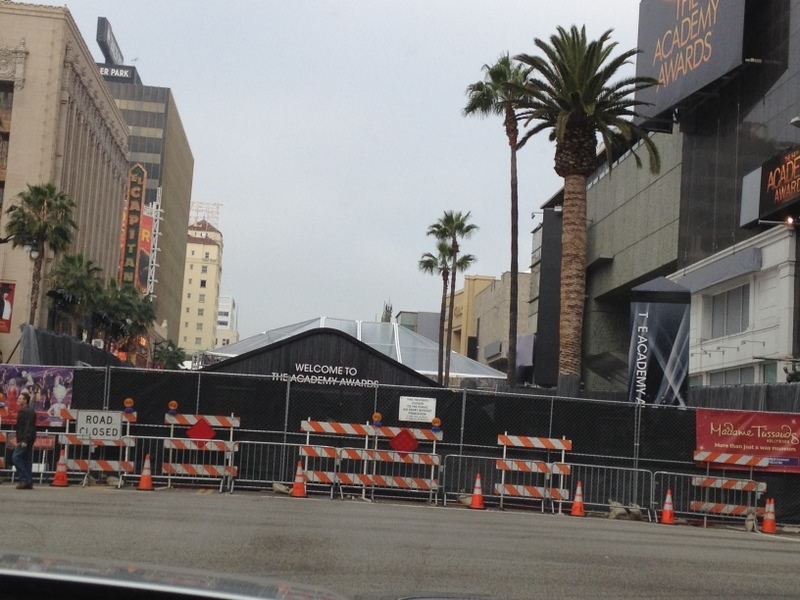 Although most of it was blocked off it was still neat to see the area where all the stars would be and to imagine them filing in on the red carpet in their Prada, Gucci, what have you. I was imagining Brad Pitt and George Clooney looking so studly in their Armani suits smiling for the millions of fans. Very neat! 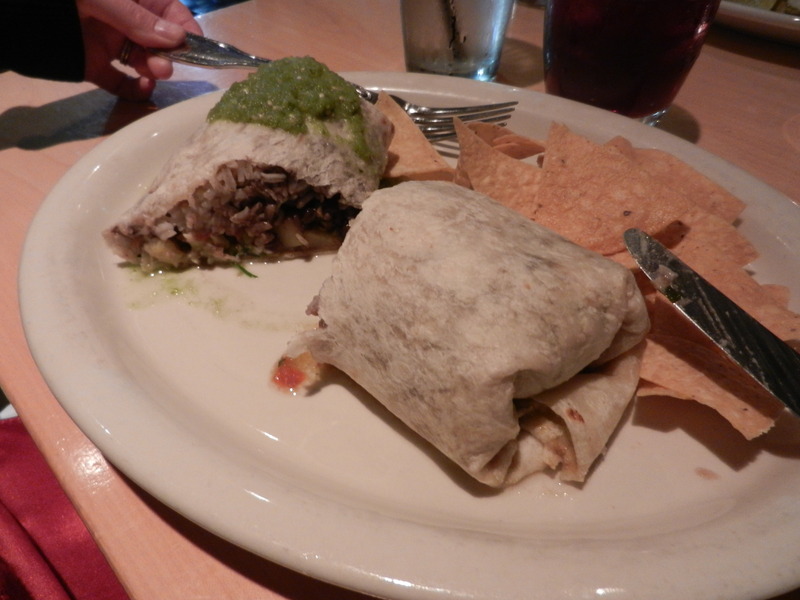 For dinner this first night we headed to a Mexican restaurant called Loteria Grill. I ordered the Burrito Calabacitas which is made up of zucchini and roasted corn succotash, salsa verde, onion, cilantro, queso fresco, and beans and rice. Oh geez, good thing I was hungry! That thing was mammoth-sized! Dana had shrimp tacos and Dalynn had the Chilaquiles. Everyone loved their food. After dinner we kicked around what we wanted to do. Dana and I were exhausted from our 3:30 am wake-up call that morning and were hardly functioning at this point so we actually decided to call it an early night and were sleeping by 9:30 pm. Yup, in Hollywood. We are pretty crazy aren’t we?! I mean really, we need to settle down because we are getting ridiculous. 😉 I was so happy to sleep. I wanted to be well-rested so I could be fully re-energized for the next days ahead! So there you have it. Day Numero Uno. It was awesome! Dalynn, it was so great to see you and thank you again for letting us stay at your place! Hope you can make it back to MN in the near future. Random off subject note: We did not make it into Grandma’s Half Marathon lottery. We are pretty disappointed but there is nothing we can do about it so we are thinking it happened for a reason and it wasn’t meant to be. However, we WILL still be running the Minneapolis Half Marathon in the beginning of June so we are very pumped for that! Now we just need Spring to roll around so we can really kick training into high gear! Yeeahh! So happy to be back. California day two, coming up next! We may have spotted a celebrity btw! Be sure to check in later gators. This entry was posted in Friends, Vacations and tagged Half Marathon, Restaurants, Vacations by Melanie. Bookmark the permalink.